The Mountain zebra is the second of the three zebras species we'll study, so take a look at the first photo. This zebra lives in small family groups, not large herds. 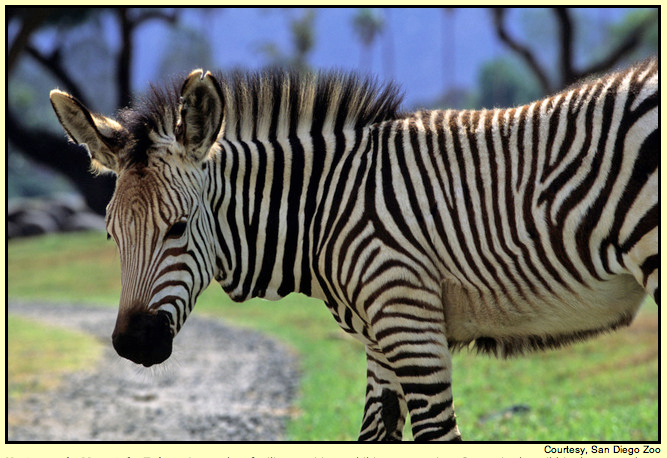 Its ears are normal-sized compared to the Grevy's Zebra and it's stripes are broad and widely spaced at the flank. 1st IK*: Dewlap on the throat of adult animals. Overall broad and thin stripes. 2nd IK: Broad pattern of stripes on flank are horizontal and change to vertical where the belly and flank meet. No underbelly stripes. 3rd IK: Back stripes zig zag across the back and get smaller toward the tail. These IKs will soon have you able to choose the Mountain zebra out of a whole herd! Stay tuned for my next post on the Plains zebra.